UIDAI has made this feature available so that all the people who have shifted to a new place or changed their Primary Mobile Number, Email, etc. can easily change it on Aadhaar with minimum time possible. We will discuss both the methods and which is most suitable and which should be followed. P.S. – According to the latest policy of UIDAI, you can only Change Your Aadhaar Address Online from UIDAI site. If you want to change any other thing like Email, Name, etc. then you have to follow the Offline Method. How To Change Address In Aadhar Card? How to Change Address in Aadhar Card Online? 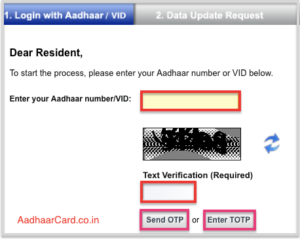 How to Change Address in Aadhar Card Offline from Enrolment Centre? Shifted to a new House or new State and want to Change your Address in Aadhar? Then you are in the right place. I will share both these methods, Depending on your Preference you can choose the one you like the most. If you are Tech Savvy, then follow the Online Method, but if you are not a Tech Savvy which is alright, then you can follow the Offline one. Changing your Aadhar Card Details online can be a real time saver especially if you are a working person who is busy in his/her job. Remember Every Minute Counts! Note – All Online Updates are Free of Cost. UIDAI also understand you, and that is why they have made an Online Portal called Aadhaar Self Service Update Portal(SSUP ) by which you can change your Aadhaar Details Easily. 2. 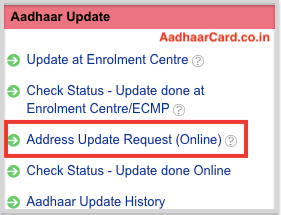 Click on Address Update Request (Online) under the Aadhaar Update Category which will redirect you to another page. Note – If you don’t have a Valid Address Proof to send to UIDAI, then you must follow this Guide otherwise follow above steps. 3. Click on Update Address, and you will be redirected to Aadhaar Service Service Update Portal. 4. Enter your Aadhaar Number/VID, Text Verification(Captcha) and then click on either Send OTP or Enter TOTP based on your preference. 5. Tick Mark Have Address Proof and Click on Submit button. 6. 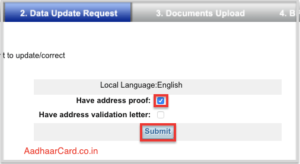 Enter Your Address Details according to your Valid Address Proof and click on Submit Update Request. 7. Recheck all the information, If you see something wrong in your Address then click on Modify and Change Address otherwise Click Proceed. 8. Now you have to Browse your Valid Proof of Address from all the options and Click on Upload. 9. Now you will see a Confirmation Dialog which asks you – Have you uploaded the Original Scan Copies? And Is the Document there in the UIDAI Valid Document List. If the answer to both questions is Yes then Click Yes otherwise Click NO and Reupload a New File. 10. Select the BPO Given on the Screen and Click on Submit. 11. Now a Message will appear “Update Request Complete” with the option to Download or Print your Update Request Number(URN). Once the Update is successfully applied, you can Download the Updated Aadhaar and Use it. Note – URN is mandatory to Check the Status of your Update. It is suggested to Download and Print the URN. After Placing an Update Request, it is very crucial to check the Status of your Update to know whether the Changes have implemented or your Request is rejected. This Process of Aadhar Address Updation can take up to 60-90 days, but it will be updated in next 5-10 days. Do you want to Change Address in Aadhar from Enrolment Centre? Then you are in the right place. If you are not very much Tech Savvy or don’t want to do the update process online, then Enrolment Centre is an excellent choice as Officials will do everything and you will be saved from Tedious work. But How You Do That? #1. You have to Find the nearest Aadhar Enrolment Centre, take the update form from the officials and fill it. Tip – Please Don’t Ask Google for the Nearest Aadhar Enrolment Centre. It may work for you, but in my case, the Enrolment Centre has shut a long time ago, which was BTW Frustrating and time-wasting. #2. Make sure to carry a copy of Supported Proof of Address(POA) and Enrolment Form while going to the Enrolment Centre. Note – You must also carry the Original Document along with the Copy One. In case the Officials feel that the Copy is Edited then they may ask for Original Document just for a glance(Not Compulsory). #3. Submit the Copy of Proof of Address(POA) and the Form to the Officials. #4. You will be charged ₹25- for your Address Update as it comes under Demographic Update. #5. The officials will give you an Acknowledge Slip that will help you to know the Status of your Aadhaar Card. Note – If somebody is overcharging you then you must File a Complaint. Download the latest Aadhar Address Change Form from here. Just moved to a new place but don’t have a valid Address Proof? Worried about How you will change your Address in Aadhar without Proof? Then you are in the right place as Today I am sharing How you can change your Address without a Valid Address Proof. UIDAI came to know that there are people who shift to a new place and don’t have a valid Address proof. These people face a massive problem in changing their Address because of the Requirement of a Valid Address Proof to change their Address. Thankfully Now you have a new feature with the name Aadhaar Validation Letter which will help you in changing Address without Valid Address. The Process is simple. First, You have to Request for Address Validation letter, and that letter will contain a secret code which you have to put for Changing Address. 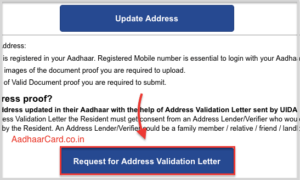 Note – To request for the Address Validation Letter the Resident must get consent from an Address Lender/Verifier who would allow his/her Aadhaar registered Address to be used by the Resident. An Address Lender/Verifier could be a family member/ relative/friend/landlord where the resident is presently residing. #1. Head Over to UIDAI official website. #2. Click on Address Update Request (Online) under the Aadhaar Update Category which will redirect you to another page. #3. Now you will see Two Buttons, Click on Request for Address Validation Letter which will take you to another page. #4. Enter your Aadhaar Number, Text Verification and click on Send OTP or Enter TOTP depending on your preference. #5. Enter your OTP or TOTP and click on Login and you will be redirected to another page. #6. Enter your Address Verifier Aadhaar and click on Submit. Note- The Address Lender/Verifier must be willing to give his/her consent allowing the Resident to use his/her address to be updated in the resident’s Aadhaar. #7. You will get a Service Request Number(SRN), be sure to note it as it is crucial. #8. Now the Address Verifier Receives OTP intimation & Link for consent in his/her mobile, and he/she has to approve/reject the option for providing Address. Note – Both Address Lender/Verifier and Resident(You) must have their mobile numbers registered in their Respective Aadhaar. #9. If they Confirm the consent, then you will get a message about that. Now you have to Login with the Service Request Number(SRN) with the Link. 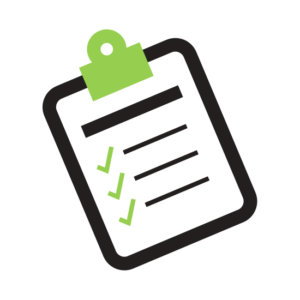 Note – If the Address Verifier does not give his consent within the required time then the request will be invalid, and you have to initiate the whole process again. #10. After Logging in Now, you must Preview the Address, Edit the Local Language(only if requires) and click on Submit Button. #11. An Address Validation Letter will be sent to the Address Verifier’s Address(the person who granted his/her Address) which has a Secret Code Number. #12. Now you have to follow the same process, But this time you have to click on Update Address and not Request for Address Validation Letter. #13. Enter your Aadhaar Number, Click Send OTP, Enter OTP and click on Login. #14. 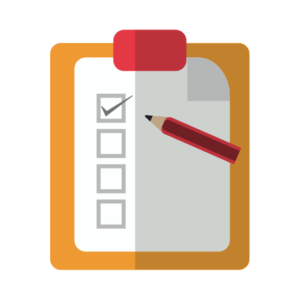 Select Have Address Validation Letter and Click on Submit. #15. Now you have to Enter secret code given in the address validation letter in the field and Click on Verify. #16. Now you have to Preview your Address and check that everything is alright(which it is) and then click on Submit. #17. Your Request is Submitted, and you will see the options to save and to Download your Update Request Number(URN) which is very important. Note- I Personally Prefer that you do both, i.e., save your URN and also download it. You can also note it somewhere if needed. 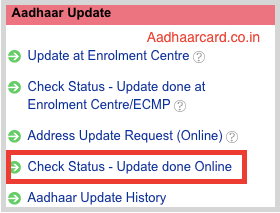 After getting the URN now, you should check the Status of Aadhar Update(See How Below). Did you recently Updated your Aadhar Card Address Online and wanted to check its status? Then you are in the Right place. Checking the Status of Your Aadhar Update done online is a little tricky, so I want you to follow me step by step. 2. Click on Check Status – Update done Online option under Aadhaar Update section and you will be redirected to a new page. 3. 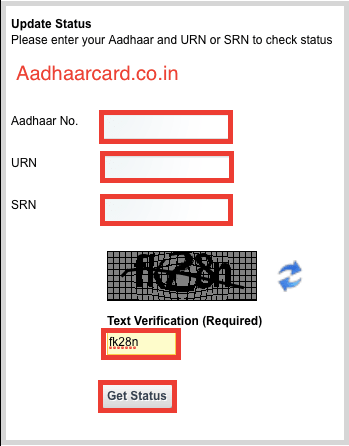 Enter your Aadhar Number, Your Update Request Number (URN) or Service Request Number(SRN) and Captcha in their Fields and click Get Status. Note – You have to write URN or SRN and not both. Online Updation will give you a URN Number while Offline Update will provide you with an SRN Number/Updation Enrolment Number. 4. Click Get Status, and you get the Status of your Aadhaar- Whether it is Being Verified, Rejected, Applied, etc. Your name is your identity which must be same on your documents to be validated, but sometimes the name on your aadhaar card does not match with your real name. In that case you need to change name in aadhar card and by following the steps below, you can easily change your name in your card. #2. Make sure to carry a copy of Valid Proof of Identity, Proof of Address(POA) and Enrolment Form while going to the Enrolment Centre. #3. Submit the Copy of Proof of Address(POA), Proof of Identity(POI) and the Form to the Officials. #4. You will be charged ₹30(25 + GST) for your Address Update as it comes under Demographic Update. Your change in name will be reflected in a week or two(maximum time is 90 days), and within that time you must check its Status Frequently. Do you want to change your picture in your uidai card? Well, there can be various reason as to why you want to do that. Maybe you are grown up and the picture doesn’t match your real face or the picture on the card is worst and you wish to change it. By following the steps given below you will be able to easily change photo in aadhar card. #4. Now the Executive will take your Live Photograph. #5. You will be charged ₹30(25 + GST) for your Address Update as it comes under Demographic Update. #6. The officials will give you an Acknowledge Slip that will help you to know the Status of your Aadhaar Card. Your change in Photo will be reflected in a week or two(maximum time is 90 days), and within that time you must check its Status Frequently. Your Mobile Number is the most important factor when it comes to your card’s security. For doing anything with aadhaar you need OTP. But sometimes we lost our mobile number by getting a new sim or misplace our old sim which unable our access to any of the OTP’s. Well, the good news is you can easily update your aadhar card mobile number by changing it with the steps given below. #2. Make sure to carry your Original Aadhaar Card. Note – You don’t have to submit any documents for changing your Mobile Number, but I will recommend you to carry a Proof of Identity like School/University Card etc. Sometimes the officials can ask you for an Identity proof. Your change in Mobile Number will be reflected in a week or two(maximum time is 90 days), and within that time you must check its Status Frequently. While registering for aadhaar we have the option to give our email id for security purposes like getting OTP. But, it is common to forget the email after making some new ones. If you have forget your email id and don’t have access to that then you have the option to change email in aadhar card. You can easily update it by following the steps below. Note – You don’t have to submit any documents for changing your Mobile Number, but I will recommend you to carry a Proof of Identity like School/University Card, etc. Sometimes the officials can ask you for an Identity proof. Your change in Email will be reflected in a week or two(maximum time is 90 days), and within that time you must check its Status Frequently. It is quite amusing and frustrating to see a change in gender in our aadhaar card. Well, it is not your mistake as the UIDAI has mistakenly printed it on your card. But you can not go on with this card as the details are not proper. So to fix the issue you have to change gender in aadhar card by following the steps below. #4. You will be charged ₹30(25 + GST)- for your Address Update as it comes under Demographic Update. Your change in Gender will be reflected in a week or two(maximum time is 90 days), and within that time you must check its Status Frequently. When you submit your aadhaar card to avail a service your date of birth is also taken into consideration, but sometimes UIDAI mistakenly print a wrong Date of birth on your card. With a wrong DOB you are unable to avail the services which can be frustrating. But there is a good news for you. Well, You can easily Change DOB in Aadhar card by following the steps below. #2. Make sure to carry a copy of Valid Document Required for Changing DOB from the List. Your change in DOB will be reflected in a week or two(maximum time is 90 days), and within that time you must check its Status Frequently. After placing an Update Request in Aadhaar Enrolment Centre, you get a Service Request Number(SRN) which the people say is used to check the status of Request. But we have never done that before, How will we check the Status of Aadhar Update done at Enrolment Centre? Well, Today I will share with you How to Easily Check the Status so without further ado, let’s get started. #2. 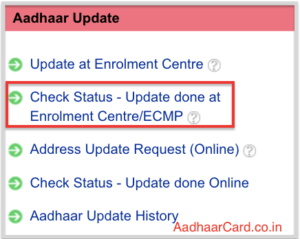 Click on Check Status – Update done at Enrolment Centre/ECMP under the Aadhaar Update Section. #3. Enter your Enrolment ID, Date-Time, Security Code in the Field and click Check Status. P.S. – The Enrolment ID and Date-Time are given on the top of your Acknowledgment Slip. #4. If your Update Request is Accepted and Applied, then you will see a message saying “Congratulations! Your Aadhaar is Generated!”. Otherwise, it may say that your Request is being Verified or Processed or it may not open this page after clicking Submit(Maybe). Apart from the Online Method and Enrolment Centre, You can also Update your Aadhar Card Details through Post. Well, Updating your Aadhar Card through the post is a long process which you may not want to choose if you want to update your Information fast. But if time is not the issue at all, then we must start with the process. So without further ado, let’s get started. #1. You have to Find the nearest Aadhar Enrolment Centre, take the update form from the officials. #2. Fill the information carefully and ensure that you write the updated information of what you want to change. For example, if you want to change the Name from R. Kumar to R. Sharma, then you must write the new Name in the Name Field. 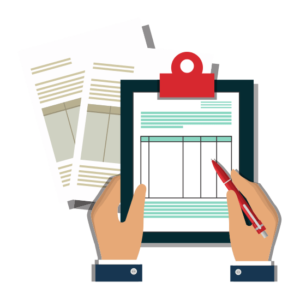 Note – You should photocopy one document from POI and one document from POA. If you have a document that is in POI and POA then also you must send two photocopies of the same document. #4. Sign the Update Form and send the form along with photocopies to the Postal Address Given Below. Note – Write “Aadhaar Update/Correction” on the Envelope, and it must be properly Readable. Did your update Request got cancelled? Or you are just curious about knowing What thing can make your Aadhar Update Request to Cancel? #1. Under Review – It means that a person will personally check your Aadhar Request and Documents and that person will process your Request further. #2. Rejected – If the person sees some blunder in your Form or submitted documents, then he/she will cancel your Update Request. #3. Successful – If everything is alright then your Request will be successful, i.e., Applied. If your Request is Cancelled/ Rejected, it is evident that your Document has some Blunder in it which you must have correctly Written. #1. The form should be Duly filled and must not be incomplete and must not have any error. #2. Sufficient Documents should be sent along with the Enrolment/Correction form otherwise your Request will be cancelled. #3. Make sure that all the Documents sent are Self Attested. #4. If there is any mismatch of information provided in the Form and Documents, then your request will be Rejected. If for any reason your request is cancelled then you have to follow the complete procedure from the beginning, i.e., again filling the Enrolment Form and Submitting it. Ahh! It is painful, but you have to do it. Here is the List of Proof of Identity(POI) and Proof of Address(POA) Documents. -- Marriage Certificate issued by the Government, containing Address. Marriage Certificate issued by the Government, containing Address. Q. Can we Change Aadhar Card Number? A. No, you can never change your Aadhaar Card Number because it is a Unique Number Assigned to a person Identity. Once an Aadhar Number is assigned, it can never be Changed. Q. Can we Change Aadhaar Details Online? A. Yes, You can change Aadhaar Details Online, but according to UIDAI new Policies, you can only change your Address Online and for all other things you have to visit the nearest Enrolment Centre. Q. 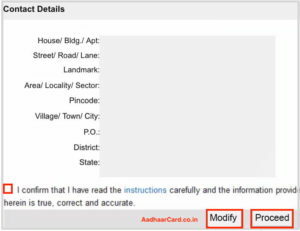 How Can I Change Address in Aadhar Card? A. You can easily Change your Aadhar Address Online and Offline. According to your choice click on the link below which best suite your preference. Q. Can I Change my Aadhaar Photo? A. Yes, you can Easily Change your Photo in Aadhaar Card by Following How to Change Photo in Aadhar Card. Q. How can I change my Aadhaar Card Photo? A. You can Change your Aadhaar Card photo by simply following the procedure mentioned in How to Change Photo in Aadhar Card. Q. How can Change Aadhar Mobile Number? A. You can change your Mobile Number by Downloading the Aadhaar Enrollment/Update form, filling it and then following the below method. Q. How can Change Aadhar Address? A. You can change Aadhar Address by Online and Offline method depending on which one you prefer the most. Below is the link to both of them. Q. How can Change Aadhar Card Name? A. Changing your Aadhar Card Name is pretty Simple, you just have to download the Aadhaar Enrolment/Update form and follow the Below link. Q. Where we can Change Aadhar Card Address? A. You can change your Aadhar Address either by going to UIDAI website and following the Online method or going to your Nearest Enrolment Centre and following the Offline Method. Q. How can Change Aadhar Address Online? A. You can change your Aadhar Address Online by going to the Official website and following the link below. Q. How can Change Aadhar Card Language? A. When you update your Address Online or Offline, then you have the option to change the Local Language of your Aadhaar. Q. How change Aadhaar Mobile Number? A. You can easily change your Mobile number in Aadhaar by visiting the Nearest Enrolment Centre and following the below link. Q. How to change Aadhar linked Bank Account? 1. Visit your Bank and tell them that you want to Delink your Aadhar from the Bank and then you have to follow their procedure. 2. Close the bank account, and it will Delink from the Linked Bank. Q. How to change Aadhaar Number? A. You cannot change your Aadhaar Nuber as it is your permanent Unique ID. Q. How to Change Aadhar Card to Smart Card? A. There is no such term as Smart Aadhar Card. It is just printing your E-Aadhaar Card on PVC/ Plastic Card. 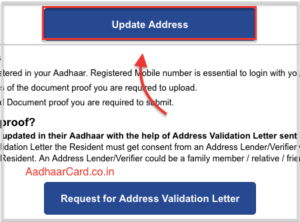 Q. Update Email and Mobile Number in Aadhar? A. You can change your Email and Mobile Number together by visiting your Nearest Enrolment Centre. You cannot change your Email and Mobile Number Online. First, you have to Download the Aadhar Enrolment/Update Form and follow the guide below. A. According to the latest UIDAI policy, you can only Update your Address Online and rest all other things like Email, Mobile Number, DOB, etc. can be changed by Visiting your Nearest Enrolment Centre. A. You can only Update your Address through Self Service Update Portal Online. In the offline way that is by visiting Aadhaar Enrolment Centre, you can update Everything including your Biometric(Retina and Fingerprint) and Demographics Details(Name, Address, Email, etc.). Q. Are there any criteria to be met to request for changes online? A. To Request for changing your Address Online you have to submit a scanned copy of Proof of Address to UIDAI. Check which Proof of Address you can send by link below. A. Language is not an issue; you can submit the Update request in any language. A. If your Mobile number is not registered with Aadhaar Authorities, then you cannot avail any online facility on UIDAI related to your Aadhaar. Neither you can Download your Aadhaar, nor you can request for Address update and so on. A. You can register your Mobile number by visiting the nearest Enrolment Centre, taking the Updation Form from the Officials, filling it and then following the below guide. You do not need to give any documents to the officials, just take your Original Aadhar Card. A. You do not have to provide any documents in order to update your/ change your Mobile Number. Just take your Original Aadhaar Card while going to Enrolment Centre. A. Yes, you can request for a change in information by visiting your Nearest Enrolment center and then telling the officials that you want to change something in your Aadhaar. Then take the form, fill it, give the Biometrics, Give₹30(25 + GST), take the Update Acknowledgement slip and Voila. A. You can send the post/letter to any of the Address below. A. Yes, you can change the information pertaining to your child by putting an Update Request. But remember that you have to give your own Aadhaar Detail as well. If you have changed anything in your Aadhaar like Address, then you must also change it in your Child/ward. A. Yes, you can update your Child Address easily by putting an Update Request by visiting the Nearest Enrolment Centre. For the Document, you can give you own Aadhaar as your child proof of Address. Q. 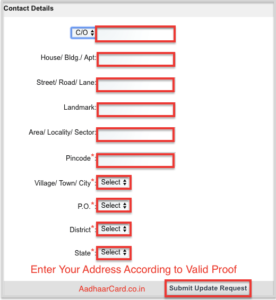 What is Address Validation letter for aadhar card? A. 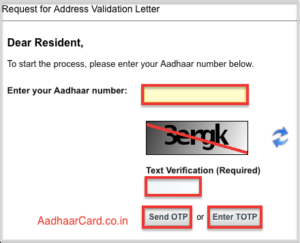 Address Validation letter is a letter sent by UIDAI which contains a secret code. This secret code is used to Update Address Online without having to have a Valid Proof of New Address. A. Oh Yes Definitely, if your own Address is Changed/Updated then you can give your Aadhaar Card as a proof for your Child Address and change his/her Address. But if your own Aadhaar is not updated, then you have to update your own Aadhaar Address first. If you have changed your Address Recently and have a Valid Proof of Address, then follow the guide below. If you have changed your Address recently but don’t have a Valid Proof of Address then follow the guide below. Q.Do I have to provide my old information while requesting for change/ correction/ modification of information? A. No, you don’t have to provide your old information while requesting for change/correction/modification, but you have to provide the proof mentioning your new information. For example, if you want to update your Address from Delhi to Mumbai, then you have to provide a Valid proof that you are living in Mumbai. A. No Salutation is needed when you are applying for making corrections in your Aadhaar. However, you have to mention your full correct Name to update your Name in Aadhar Card. A. No, you cannot modify or change the information after you submit the request for correction online. Request once submitted is submitted so be very sure about the information that you mention. Always make sure that the information you are providing is fully correct. A. If you are asking Will you get a New and Updated Aadhaar card in the Letter then the answer is NO. You can get your Newly Updated Aadhaar by Order Aadhaar Reprint in which UIDAI will send you your Updated Aadhaar by Speed Post. It will reach you within 20 days. Else you can easily Download your Aadhaar Card after the information is updated, print it and use it as a Normal Aadhaar Card. A. You have to visit the nearest Aadhaar Centre, Take the Updation Form, Fill it, mention the new Email ID in Email section, Submit the form, provide Biometrics, Give ₹30(25 + GST), take the Acknowledgement slip, and wait for the Update to be successful. Note – You don’t have to provide any document, just take your Original Aadhaar Card and a Simple Identity like School/University Card, and you are good to go. A. Yes, your Request Application is Rejected which by the way is painful. You can check the various reasons by which it can be rejected by clicking on the link below. A. You can not use your Aadhaar Card for anything which means it will not work anywhere which can be a hurdle in many ways. In simple words you Aadhaar Number will be something that was never generated. The Solution is first to Verify your Aadhaar Number which will tell whether your Aadhaar Number Exist or Not. If it shows Generated, then you are safe otherwise rush to the nearest Aadhaar Enrolment Centre and tell them about the situation. Make sure to carry a Valid Proof of Identity and Proof of Address for Aadhar which can be required. A. No, it is not necessary to provide C/O information in the Address. You can mention W/O, S/O, D/O in your Address. But whatever you will specify will be updated in your Address as well. Q. How much time does it take to update the address in the Aadhar card? A. In my Personal Opinion, it will be updated in anywhere between 5-10 days from the date of Request. But in some cases, it can take a little longer. UIDAI says that it can also take a maximum of 60-90 Days. So just Hope that it gets updated Soon.